At NitecoreStore.com the LC10 is currently around $20. 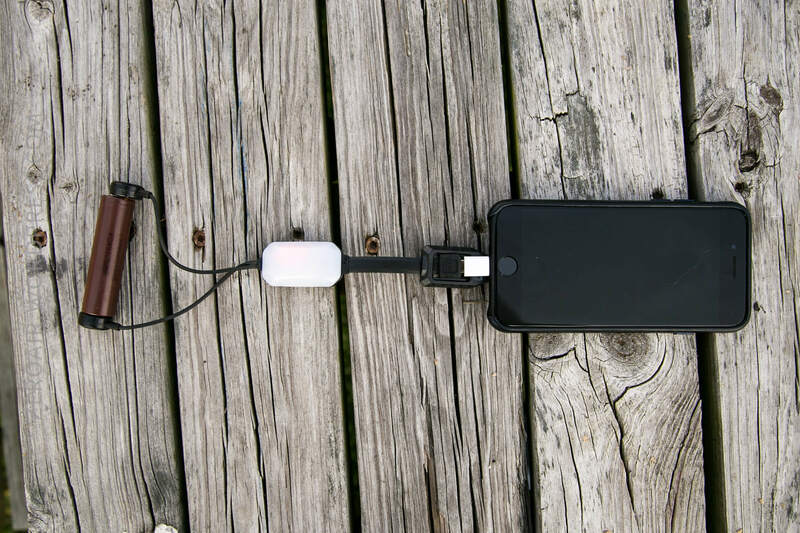 This is a very neat little charger, which doubles as a lantern, and includes a neat accessory attachment allowing iPhone charging. Definitely one of the better versions of this type charger I’ve seen. This item sports Nitecore’s standard colors (though, much more yellow? a new thing for Nitecore?). 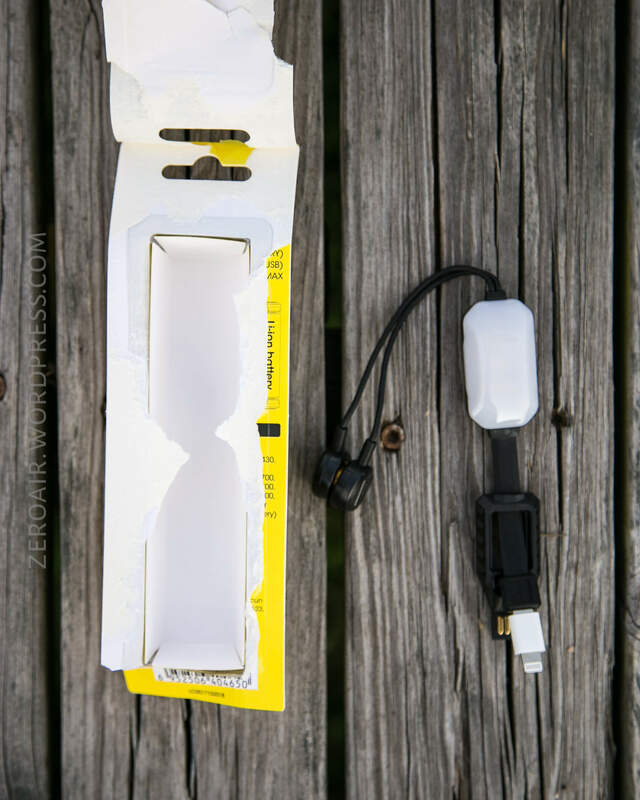 The item is fully visible through the blister pack, and the back has most of the needed specs. Unfortunately this isn’t one of those “easy entry” blister packs. The package must be nearly fully destroyed to get the item out. While the product listing does state that a manual is included, I did not receive a manual with my item. Fortunately Nitecore is great about having their manuals available online. Here’s a link to the PDF manual. It’s a very typical Nitecore manual. I don’t necessarily mind that it wasn’t included in the package, since it’s available on their site. 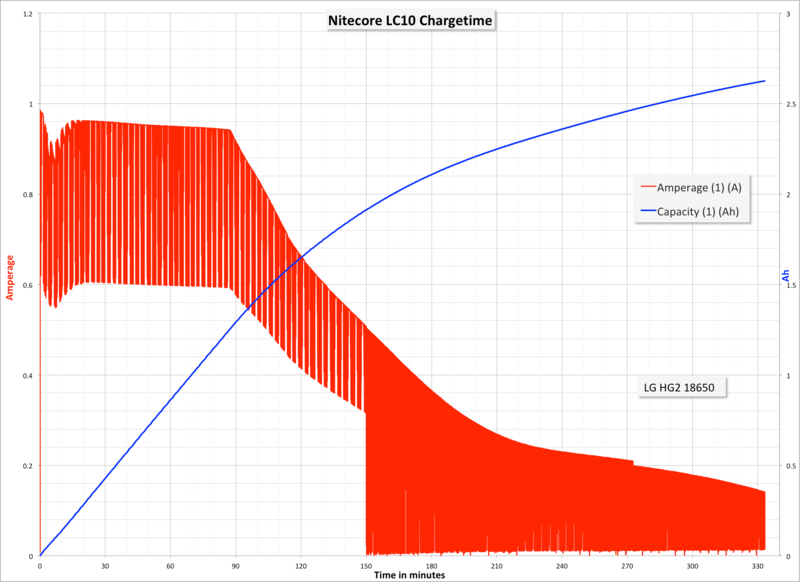 The LC10 is a nice little charger, built to Nitecore’s usual standards. See more detailed photos below. But in general, everything about this charger is well made and fits just like it needs to. 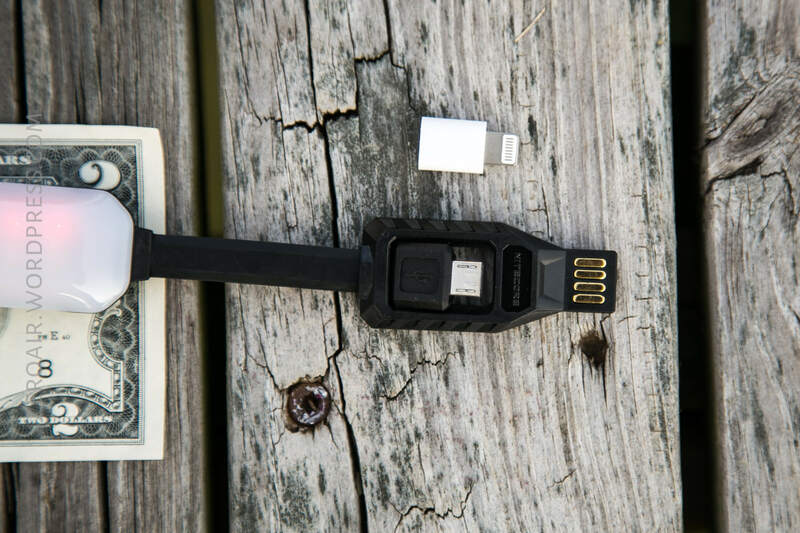 The micro-USB plug, which plugs into the back of the USB plug does so very securely. The USB plug is thinner than “normal” plugs, but still one sided. It would have been a nice touch for that to be a double sided USB plug, which would allow plugging to a USB port in either orientation. More on the build quality of the lantern portion of this light later, but suffice to say I’m pleased with it. The opaque diffuser covers six emitters. Three white, and three red. These red are used in various ways (notably, to indicate charge status and state.) The white have three modes, and are diffused very broadly. Officially the size is L-9.65″xW-0.96″xH-0.73″, and 28g. That size and weight doesn’t include a cell that you might be charging or using, however. The LG HG2 has a max weight of 47g, but you could opt for smaller LiIon cells to reduce weight further. 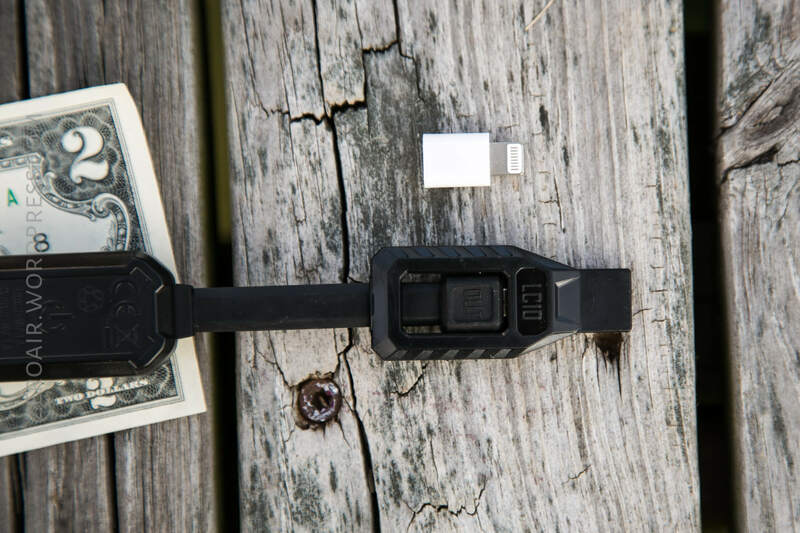 Power is provided to the LC10 by a regular USB plug, which fits into a regular USB port. The plug is thinned down, so it doesn’t have the usual metal cover over the male plug. The back of the plug is open, for fitment of the micro-USB plug. 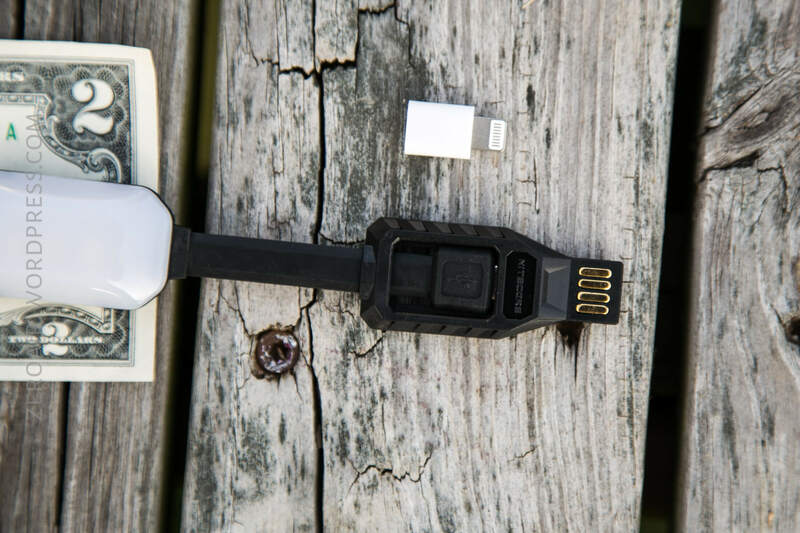 When charging a cell with the device, the micro-USB must be plugged into the back of the USB. 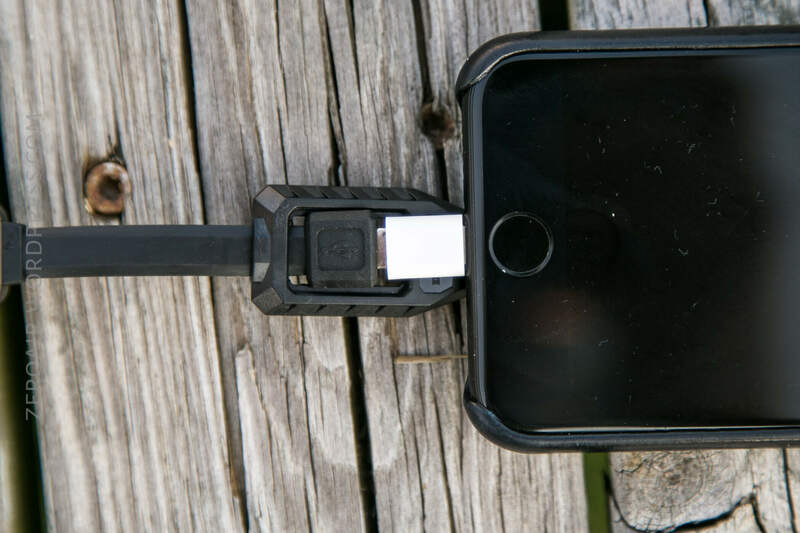 When charging a device from a cell, of course the micro-USB plug is removed, and used as a charge. The poles of the LC10 which connect to the cell are not polarity specific. This is a nice feature (and a step up from the Folomov A1, for example). So just connect your cell however it happens to land, and the charger will allow it. 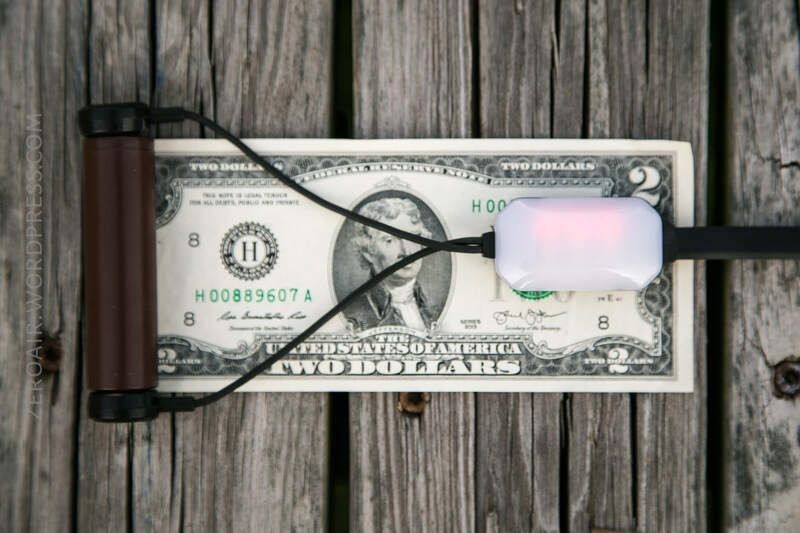 When using the LC10 to charge a device (here seen with the Lightning attachment), it’s possible to use the lantern in any of its modes. Those are off, red, white (LMH). This little lightning adapter is very handy. 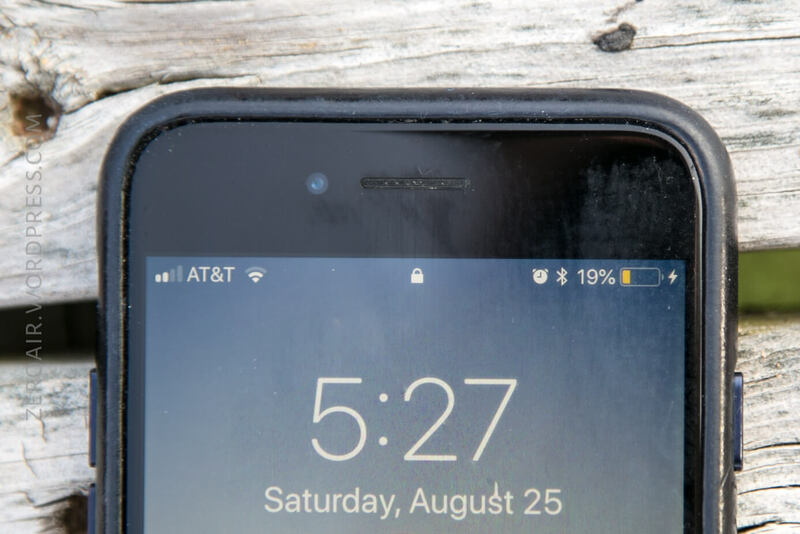 My iPhone 7 had no trouble charging from any cell I tried using. Charging a cell from USB power provided some interesting results. The charger seems to oscillate between ~1A and ~0.6A during the CC phase, and then that range narrows during the first part of the CV phase. Then the charger seems to go between CV and off for the remainder of the charge. I can’t explain this. 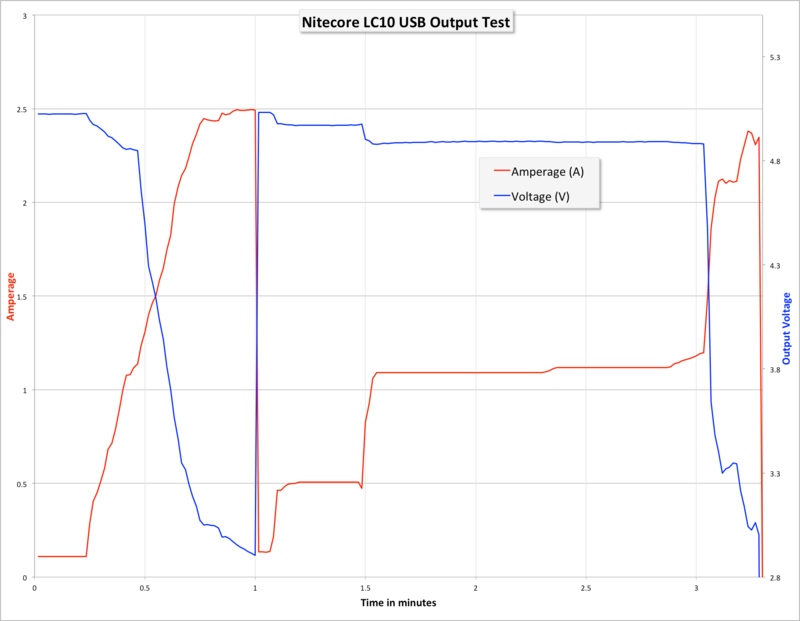 USB-out from an LG HG2 cell provided surprising results. The charger provides output all the way down to around 2.9V, where the device seems to shut off (this is also around my low voltage for detection). When at 3V or so, the output is a surprising 2.3A! Of course that’s well out of spec for USB, and might not be useful for your device. But I did test at a steady 0.5A, which the charger had no problem with (staying well above 4.8V), and then at a steady 1A, which again, the charger did well, staying above 4.8V. All in all, I’d call the USB-Out to be very good. 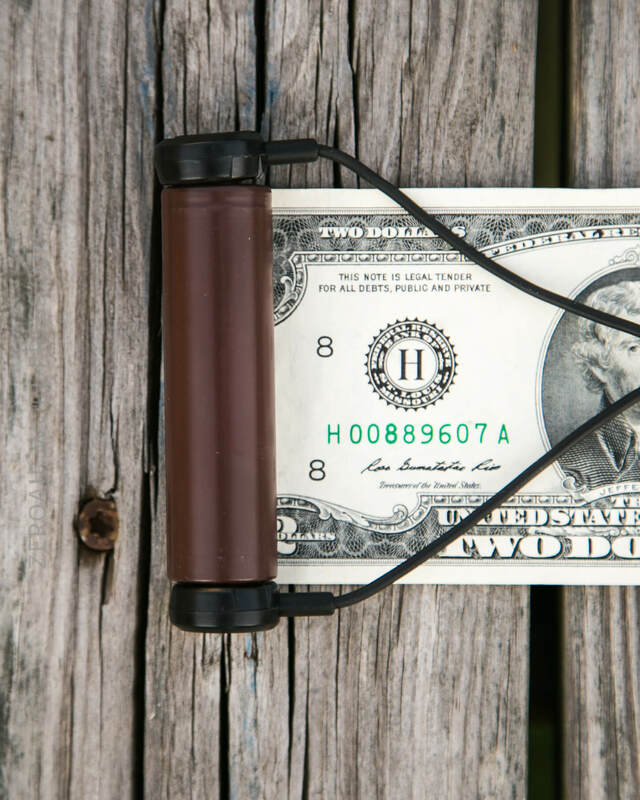 You might think about using this as a backpacking or UltraLight charger, paired with a solar panel. This would probably be a good choice. The LC10 handles blackouts and bownouts just fine – charging restarts in both cases, when power becomes available again. There’s not a lot to worry with as far as operating the device. You’ll always need to use some form of LiIon cells, but otherwise it’s very straightforward. 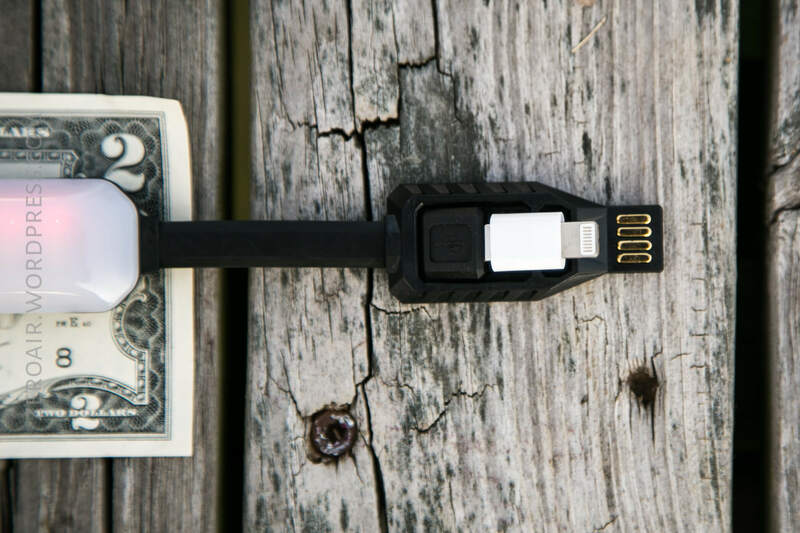 To charge a cell, plug the USB in to power (and have the micro-USB plugged in properly). You must remove the Lightning plug. 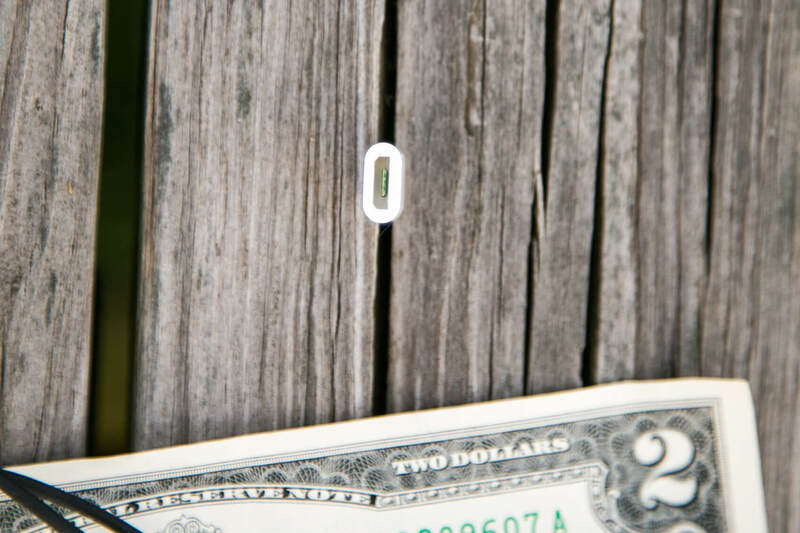 The little micro-USB to Lightning is super convenient, and completely removable. I’m sure these are available all over the place, but this is the first one I’ve had. Very useful. Below, note how the micro-USB plugs into the back of the USB plug. The shroud of the USB plug over the micro-USB plug is clever. 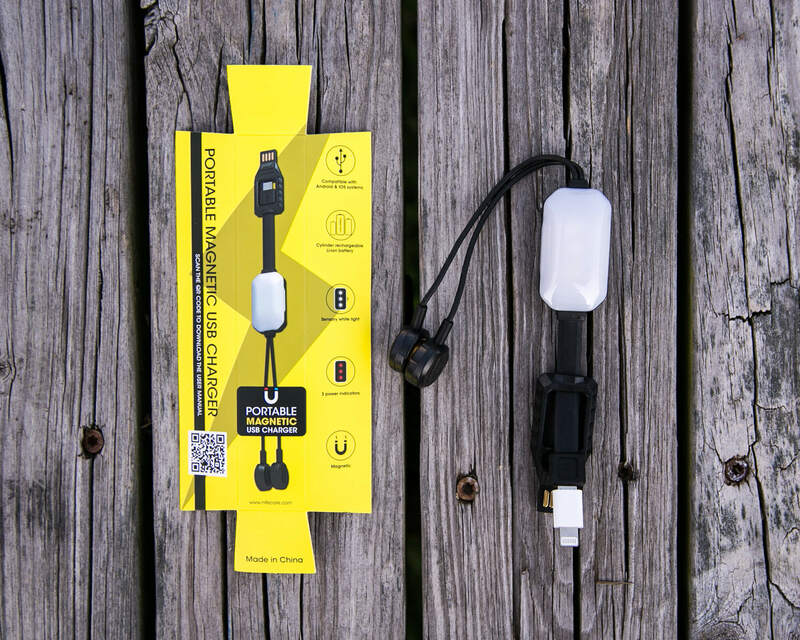 It makes connection easy, prevents needing to fiddle with orientation, and also disallows use of any other micro-USB plug. Turning on the lantern/light feature of the light is a bit confusing at first, until you realize that there is nothing to click. The switch is on the backside of the lantern (where there is a power button indicator). Tapping this switch turns on the light and cycles the modes. When a cell is connected (as below), the red light indicates how much power is left in the cell. Three red = >80% power. Two red = 50-80% power. One red = <50% power. The tapping isn’t quite intuitive. It’s taken me a while to get used to this, and often I have to try it over and over, and then switch my grip so I hit the switch just right. It works well when you do it exactly correctly, though. It’s worth noting that the light will not stay red – red is only a power indicator, and shuts off after a few seconds. All the white modes will stay lit, though. Tomorrow I will have another flashlight. And maybe a trend: Fun-Funded Friday. It’ll be a light I bought myself out of my fun fund! This item was provided by Nitecore for review. I was not paid to write this review. This content originally appeared at zeroair.wordpress.com. Have a look there for the best experience!